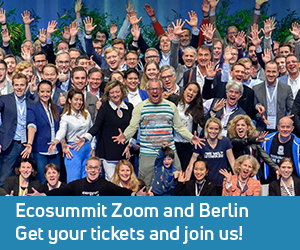 Ecosummit Ventures builds and scales a portfolio of 10 to 20 startups across multiple funds, makes its first investments with tickets of €100K to €3M in Seed, Series A and B rounds and is ready to act as lead or co-investor. The pre-marketing has started and we have interest from successful smart green founders that want to invest in our fund (soft LP commitments). Our target LPs include founders, angels, corporates, family offices, fund of funds and impact investors. LP tickets range from €100K to €20M and we aim at recruiting a unique group of 50 LPs. 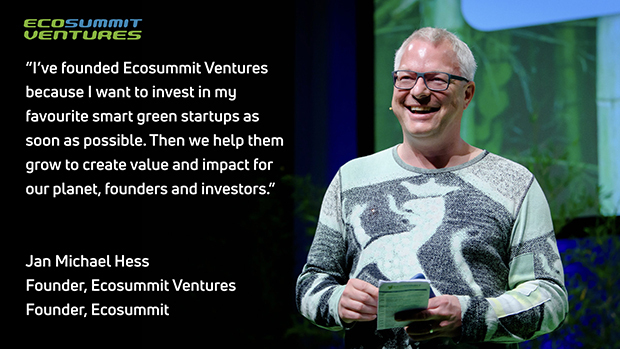 The first closing of Ecosummit Ventures Fund I is planned to take place after Ecosummit Berlin 15-16 May 2019, our 10 year anniversary conference that presents 80 startups and brings together 400 participants. Our goal is to generate financial and strategic returns for our LPs as well as a lot of environmental impact. 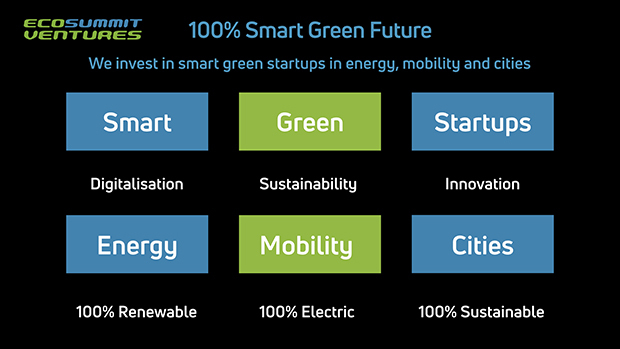 The General Partner (GP) at Ecosummit Ventures (female or male) is a smart green entrepreneur and investor with track record, passion and the long-term goal to create big impact by building big startups and accelerating the global energy and mobility transition. You have a minimum of 10 years work experience in the startup and venture capital ecosystem in digital (smart) and/or sustainability (green) markets. Ideally, you can already look back at 5 years of VC fund management experience. In your career, you have contributed to raising a VC fund and convinced LPs to believe in your fund management team and its ability to back and grow early stage startups. You write deal-winning term sheets in your sleep and have invested in a strong portfolio, attracted multiple follow-on investments and achieved at least one positive exit. Along the way, you gained a lot of board experience coaching startups through good and bad times. Ideally, you are also a startup founder having been at the other side of the table. You have raised several financing rounds for your startup and celebrated an exit that puts you in a position to invest in the next generation of startups and pass on your experience and know-how. As being an angel investor is not enough for you, you want to transform yourself into a VC and search for co-founders to start a new fund. 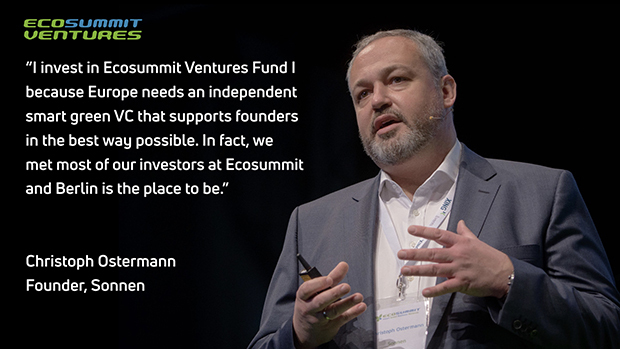 At Ecosummit Ventures, we want to be a team of 3 General Partners (full-time fund managers) at the first closing of our second fund. Each GP manages the VC process end-to-end with our portfolio companies. That includes deal sourcing, negotiation, term sheet, due diligence, investment closing, board membership, post-investment value creation and divestment (exit). If 3 GPs build a portfolio of 15 startups, 1 GP is supposed to manage 5 portfolio companies. Assuming that we are 3 GPs managing a €60M fund, each GP invests a personal GP commitment of €400.000 in Ecosummit Ventures Fund II (2% GP commitment). GP commitments have to be paid pro rata during our capital calls and are spread from the first closing of the fund to our last follow-on investment in one of our portfolio companies. The GP compensation package will be a competitive mix of salary and fund carry. The first monthly salary will only be paid after the first closing of Ecosummit Ventures Fund I. Until then, all co-founding GPs face the risk that the fundraising is unsuccessful and the first closing of the fund is delayed or cancelled. Our perfect GP joins before the first closing, shares the fundraising risk and stays with the fund for 10 years during the whole fund lifetime. As an option, it will be possible to leave the fund management company after 5 years at the end of the investment period while standard rules of carry vesting are applied. Our HQ is in Berlin and it would be super if all GPs live here. If your home is in another European city, you are expected to travel to Berlin 2 days per week for our weekly GP meetings, startup pitches, workshops and office hours. At Ecosummit Ventures we speak English and appreciate a diverse and multicultural team. 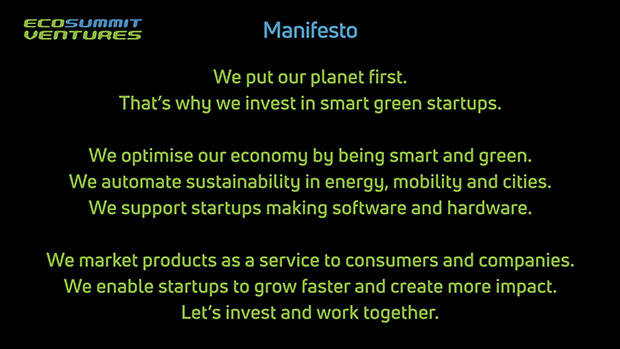 We are very motivated to build the best smart green impact fund management team in Europe and look forward to co-founding Ecosummit Ventures with you. Please email us your CV, Linkedin and motivation to apply as Ecosummit Ventures GP.